Grades and Attendance II is a complete make-over of my older G&A files. G&A II is completely different and for that reason, do not use the G&A help files for G&A II. Those with highschoolers - G&A II does not support credits and gpa. I will make one that does eventually. G&A II is brand new as of August 3, 2012. That means the file has not been field tested by hundreds of homeschoolers. If the Tabs are not visible, that means the workbook is minimized. Maximize it. Use the Tab key on your keyboard to see which cells are open for typing. When the file is opened for the first time, it will be at the Instructions tab. That tab goes through the set up steps with a few pictures. Set-up is not hard. Below are the steps. Go to the Info sheet. There you will fill in names, the student's grade; the date of the first day of school; class categories and the classes in each category; and quarter dates. Go to the Calendar sheet. Change the keys if they are not what you'd like to use. Go to the Grade Scale sheet. Look at the grade scales - adjust grade scale one (GS1) to fit your needs or use any of the grade scales as is. Note: All grade scales can be edited. Go to each Grading sheet. Originally the grading sheets are named 1, 2, 3, 4, 5, and 6. You can rename the 1-6 tabs without breaking anything. Set-up any grade weights that you need to use for each class. Optionally - name the columns with the weights. Still at the grading sheets - Choose a grade scale for each class. Still at the grading sheets - Choose the grade scale for the overall score. I believe that is all. The grader is ready to use. 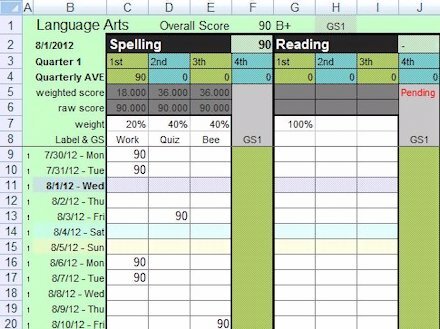 A screenshot of a portion of one of the grading sheets. I used colors and formulas to highlight a few things in the file. You will probably notice once you start using the file. Quarters - Place grades next to dates in the grader. Each date is in the correct quarter assuming that you set quarter dates at the Info sheet. Pending - This word appears when the current quarter is waiting for a scores in all of the grading columns for a class. "Pending" goes away when - 1. At least one grade is placed in each weight grading column or 2. The quarter date is past and it's a new quarter, but I should say that "pending" will still appear, but it will be there for the new quarter - and it is possible that the old quarter is still lacking a score or two. You will know by looking at last quarter's score - if it is not right, then it is still pending. This is a long way to say - If a column is "weighted" then that column will require at least one score per quarter. Enter scores as regular numbers. Do not enter numbers as percentages. The Report will display grades as they come in. When a quarter is over, that score slot will no longer receive scores. The report displays a "grade" (the letter grade) for the yearly average only. I just need to mention that this set-up with classes listed under a category might be new to some of you. Don't worry, just don't place "sewing" in a language arts category please. Try to place classes into categories that make sense. One of the grading sheets has room for 8 classes and I think a lot of you will use this grading sheet for language arts. I know that language arts can have a lot of classes. However - if 8 classes is not enough, split language arts into two categories and divide the classes between the two categories. For instance two categories could be - English and Reading. Reading could contain classes such as: Reading (that includes Comprehension), Spelling, Vocabulary, Phonics ... English could hold classes such as grammar, writing, handwriting, and public speaking. <--That is still 8 classes and some of those classes would typically not occur during the same school year. In summary - I hope that you will have enough spaces for all of your classes. I made the G&A II files with Microsoft Excel 2007 and the files are fully compatible with Microsoft Excel. Please report my mistakes to me at the feedback form. The Grades and Attendance II Workbook is "as is", for personal use, and copyrighted. The Grades and Attendance II Workbook may not be distributed in any way without permission from Donna Young. You have permission to use the grade book for your students and you may make a copy of the grade book for each student. You may make back-up copies of your student's grade books. This grade book is only available from this web site, from YoungMinds, and from the author's cd-rom. Should you see it available from any other source, please report the URL to the author via feedback form.